In my past life I was a waitress in a Mediterranean restaurant. Let’s just say it was a learning experience. I can honestly say though that I grew to love the flavors of this cuisine. We served Kabobs, stuffed grape leaves, hummus, Baba ghanoush and SHWARMA!! Oh how I love Shwarma! One item on the menu boasted to be the “Healthiest Salad in the world” called Tabouleh: a parsley salad mixed with diced tomatoes and dressing. While I don’t quite understand what makes it the healthiest in the world, it’s still pretty darn tasty!! Today I have a spin off of the traditional Tabouleh that I found in a Food and Wine Cookbook. 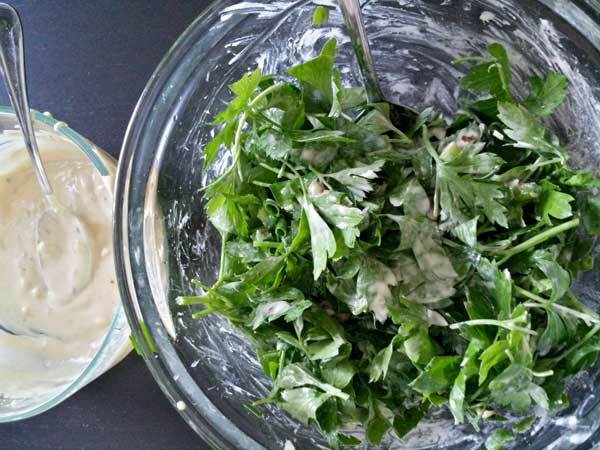 It’s the perfect pairing of greens for this lemony Tahini dressing. PLUS it goes great with our Garlic Chickpea pasta! 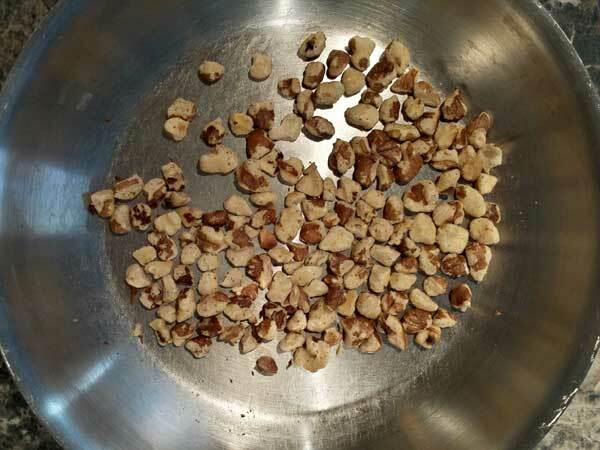 In a dry pan, toast some walnuts til they are golden brown. Set them aside and allow to cool on a plate! Meanwhile, assemble the dressing by combining garlic, lemon juice, and some Tahini paste. Season to taste with salt and pepper. This dressing is so silky and packs a flavor punch! 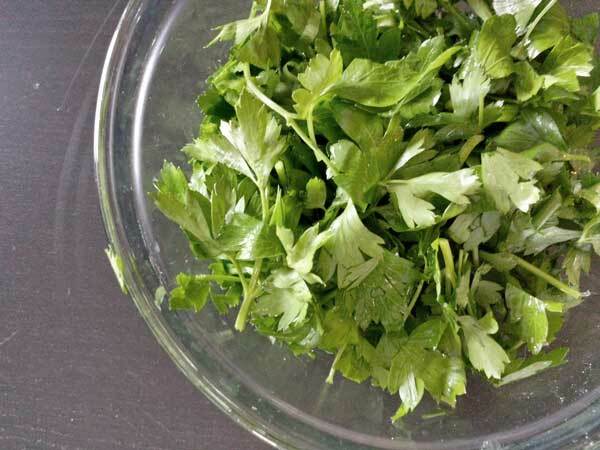 In a separate bowl toss together some flat leaf parsley leaves that have been chopped along with some thinly sliced scallions. I love how green this salad looks! Sprinkle the walnuts over the salad. Pine nuts would be a great substitution here too! Then toss the salad with the Tahini dressing until coated evenly! I love how the dressing coats the side of the glass bowl…I like to think of it as food art! The flavors of the Mediterranean culture are so very interesting to the palate! When I take a bite of this salad, I remember how special these flavors are to me. Flavors that are, in my opinion, the unsung heroes of the culinary scene! Go ahead and be adventurous today and give this recipe a shot! 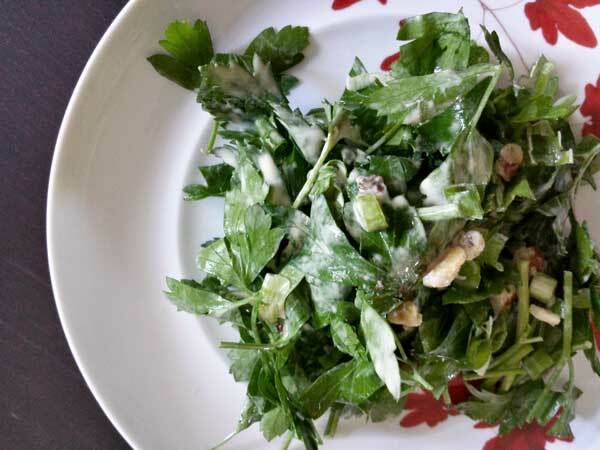 If parsley is not your thing, you can totally use other peppery greens like arugula and watercress. To me, what really screams Mediterranean in this recipe is the dressing! Toast the chopped walnuts in a small skillet over medium heat. Shake the skillet occasionally, until the walnuts are golden brown, about 4 minutes. Transfer to a plate to cool. 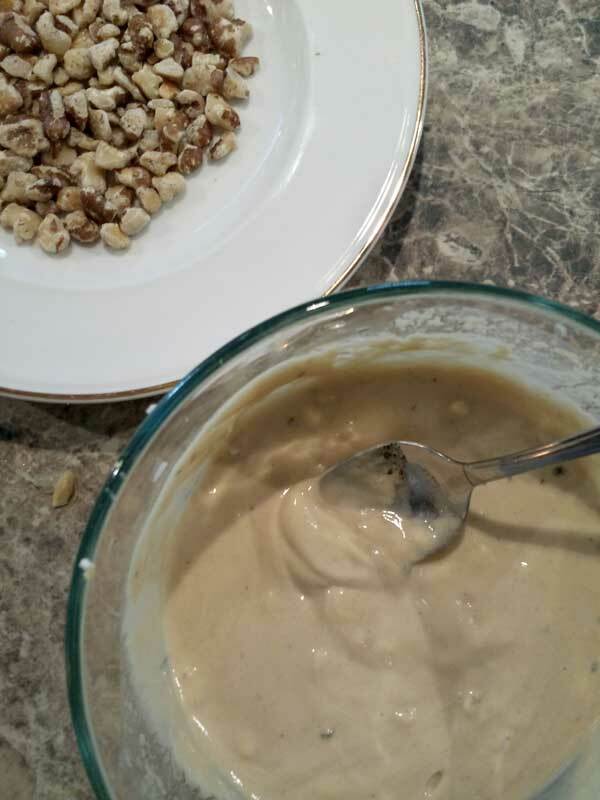 To make the dressing, mix together the tahini paste, lemon juice, garlic, and water. Season with salt and pepper to taste. 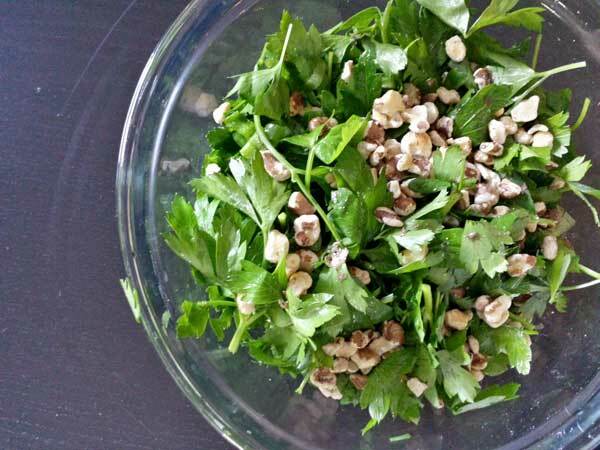 In a medium bowl, toss the parsley with the chopped scallions and walnuts. Add the tahini dressing and toss together well. Serve immediately. 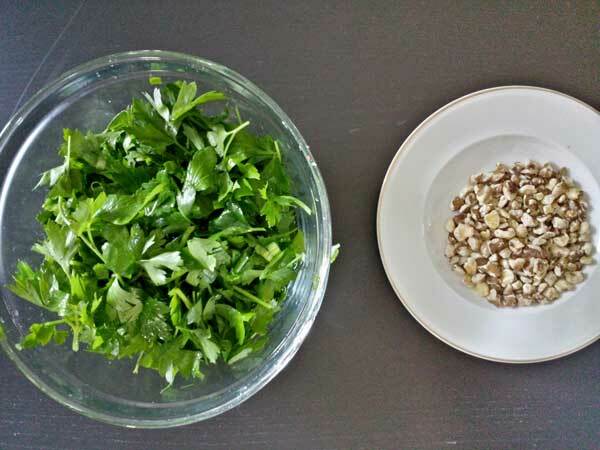 **If you’re not into eating parsley you could try this with other peppery greens like arugula, watercress, or escarole. This would also go pretty well with Kale.